Photographic studio hire is available in our fully equipped first floor studio facility. There is a range of Elincrom and Bowens lighting, flash triggers and meters. The studio is available for hire by the day, or half day. Tea & coffee is included and food can be arranged on request. 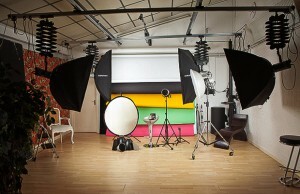 For those who wish to hire the photo studio and would like tuition on lighting and set up, this is available on request. To make a booking please use the form below. Full day £180. 9am-5:30pm weekdays. Half day £96. 9am-1pm and 1:30-5:30 weekdays. 10-2pm Saturday – extended hours by arrangement. The studio is available on Sundays by arrangement at the full day rate. Short session hire (up to 2hrs) £72.